Living on the coast, you come to expect a few things – most importantly, good seafood. The Sunshine Coast is host to some of the freshest seafood you can find, with among the best fish and chips shops in the world. Without a doubt in my mind, I can tell you that the best of the best in the world of Seafood can be found in Mooloolaba’s ‘The Spit’, an area renowned for its fresh seafood and beautiful river side scenery. So, in an area famous for its fresh seafood and fish and chip shops, how do you stand out? By combing the best produce, with a reputation for cooking it perfectly. 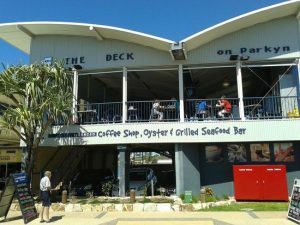 The Mooloolaba River Fisheries is exceptionally distinguished amongst locals for its beautiful and fresh offering of amazing produce, humbly cooked, just the way it should be – simply and well, at their fully licensed cafe and restaurant, ‘The Deck’ on Parkyn. Recently my family and I visited The Deck for lunch, and we were all amazed by what we found. The menu was fantastic, with Salads, Platters, Oysters, Scallops, Moreton Bay Bugs, Seafood & Fish Grills, as well as their fantastic signature dishes – all a sight to behold, and a taste not to miss. The wife, of course, only ever wants the best and ordered the Tempura Mooloolaba King Prawns, which came out looking divine. The local caught King Prawns were battered lightly in a crisp tempura batter and accompanied by a simple, fresh garden salad and a serve of traditional style beer battered chips. 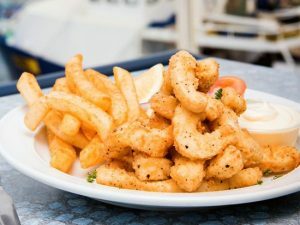 My eldest son and I shared the Fresh Seafood Platter for two – seemingly pricey at $60 for two, but with a selection of brilliant seafood that made it well worth its price tag. Crammed onto the platter was a mixture of whole Moreton Bay Bugs, large Sand Crabs, a smattering of Mooloolaba King Prawns, and Coffin Bay Oysters – with seafood sauce for dipping. More than sated of our hunger we rolled out of our chairs and tottered off along the riverside to aid in our digestion. 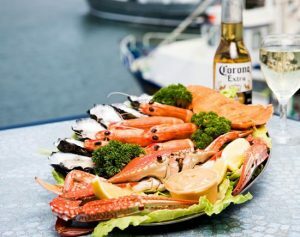 The fragrance of the seaside air filled our lungs and the breeze blew through our hair as we puffed our merry way along, very contented from our feast of the best fresh seafood Australia, maybe even the world has to offer. For more information on ‘The Deck’ and its associated fishery visit their website.